Home > Health Issues > Can Meditation Help Me Quit Smoking? The millions of people who have tried to quit smoking will tell you that the quitting is easy. The hard part is staying off the cigarettes and overcoming the withdrawal symptoms to nicotine addiction. This requires enormous mental strength and willpower - something many people don’t have enough of, which is why they fail in their attempts to quit. But meditation can help teach you to focus and calm your mind, so that you are better able to fight the urges tempting you back into smoking. Anyone who has looked into the harmful effects of cigarettes would not question the importance of quitting smoking. The smoke from cigarettes – which is inhaled deeply into the lungs – contains over 4,000 chemicals, many of which are known carcinogens, poisons and toxins. The continual exposure to these carcinogenic chemicals raises your risk of several serious diseases dramatically – these include lung cancer, stroke, heart disease, emphysema, blood clots, vascular diseases and many more. Smoking also contributes to ageing, causing deep wrinkles and eye degeneration leading to blindness, not to mention bad breath, yellow teeth and fingernails. However, despite these risks, many people struggle to stop smoking and the reason is the addictive nature of nicotine, the naturally-occurring chemical found in tobacco. In fact, nicotine is as addictive as heroine and cocaine. Therefore the withdrawal symptoms can be significant and intense. In addition to this, many people use smoking as a comfort activity during times of stress or boredom and this quickly becomes a habit. Therefore, smoking addiction has both a psychological and a physical component. Research on general addiction treatments has shown that meditation can help lower substance use and also help prevent relapses. Since smoking is an addiction just like drugs, the same conclusions would apply to the process of quitting smoking too. 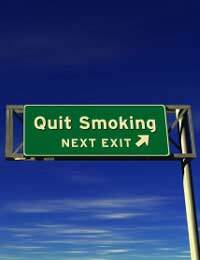 Most conventional approaches to quitting smoking involve a combination of behavioural modification and talk therapy. In cases where people are suffering strongly from withdrawal symptoms, nicotine replacement through nicotine gum or patches may be used to help with the craving and symptoms. However, these can have their own unwanted side-effects. Thus many feel that conventional treatment may be limited and lacking – or even too inconvenient, expensive or inaccessible on a day-to-day basis. For these people, meditation offers a great complementary or even alternative approach to the process of quitting smoking, which may help to increase chances of success. Many people confuse meditation with hypnosis and think it is a forced channelling of thoughts in a certain direction. In actual fact, meditation is a self-induced state which focuses on stillness or awareness itself as a goal, rather than any specific directional thought. Meditation is really about “mindfulness” – the state of being aware of your thoughts, feelings and your body in the present moment. This mindfulness enables you to accept your thoughts related to cravings and deal with them, rather than trying to avoid them which is not helpful. Ultimately, meditation provides you with the ability to change certain brain activities and thought processes – and this forms the behavioural and biological basis for successful smoking cessation. What kind of meditation can help me quit smoking? There is a range of different ways and types of meditation to help quit smoking – maybe involving the use of chanting, music, specific postures or breathing techniques. You might even use visualisation exercises or an external image. One form of meditation that is often used for addiction treatment is Vipassana meditation, where you are taught to observe and accept the presence of specific thoughts (e.g.. cravings) but not over-identify with them. This is a totally different reaction from ignoring or denying such thoughts, which can lead to feelings of blame and stigmatisation. Instead, it is important to acknowledge the reality of the addictive thought process and then to redirect that intention and energy onto something else. At the end of the day, quitting a smoking is like quitting any other ingrained habit and it requires mental re-conditioning. Meditation enables you to understand and control your own mind better so that you are better able to prepare your mind for the battles it will have to encounter in the quitting process.